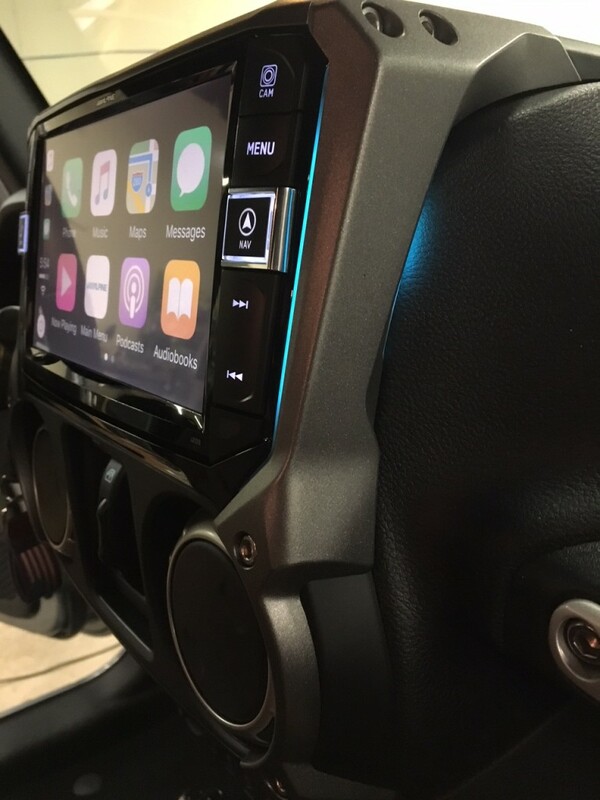 At Sounds Incredible Mobile, in Brookfield, CT, we recently had a client bring in his Jeep Wrangler to have an Alpine i209-WRA installed. We do a lot of audio upgrades in Jeep Wranglers at our shop. As some of you may know, my husband John and I both own Wranglers – he’s got a 2013 and I’ve got a 2014, both 2-door JK Sport. And although we’ve installed Alpine’s two previous Jeep Wrangler Restyle models in clients vehicles (the X009-WRA and X109-WRA), due to cost and lack of desirable features, we never wanted to put them in our Jeeps. To put it bluntly, the previous models had big beautiful screens and did a lot, but they didn’t have the KEY features consumers want these days such as Apple CarPlay and Android Auto. Alpine i209-WRA installed Jeep Wrangler at Sounds Incredible Mobile, Brookfield, CT. It appears Alpine listened to our complaints and answered with the Alpine i209-WRA. As the saying goes, the third time’s the charm. Alpine really hit it out of the park with this model. The Alpine i209-WRA is something we’d gladly put in our own Jeeps – if there were enough to go around! These babies have been selling like hotcakes and until we’ve got a steady supply from Alpine, we’ll go without – fulfilling our clients orders first and foremost. The devil really is in the details and Alpine really thought this out. Not only is this big beautiful 9-inch screen water resistant and dustproof, it has a high visibility WVGA capacitive touch screen designed to be bright even in sunlight. Additionally the gun metal trim nicely compliments the Jeep Wrangler interior and includes very subtle, but attractive side lighting. I’m totally a sucker for details like that. 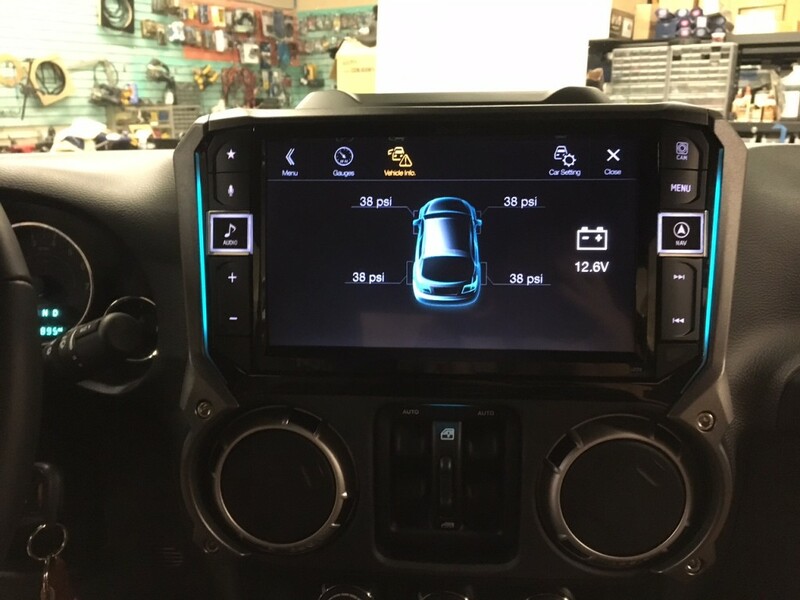 The other really cool thing about installing the Alpine i209-WRA is Alpine pretty much includes everything you need for the install. 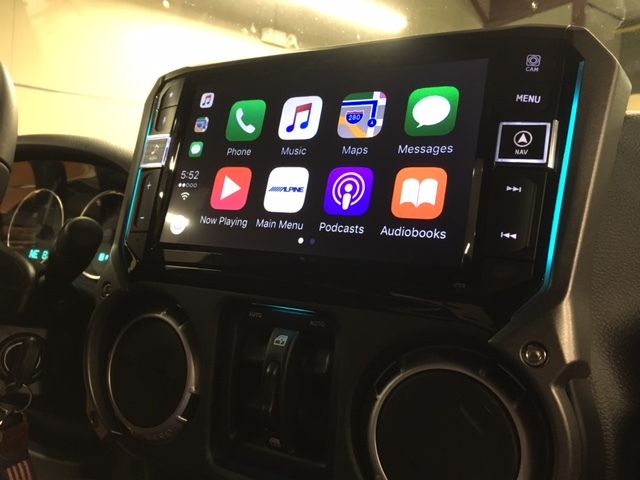 Unlike any other aftermarket head unit, you won’t have an elaborate and costly list of parts tacked onto the bill in order to have it installed. There are a handful of popular accessories for the i209-WRA that are not included. One of those is the SXV300 SiriusXM tuner. They don’t include this piece of hardware because not everyone wants SiriusXM. However, in case you do want to add SiriusXM, it does come with the iDatalink SAT1 adapter. This allows you to retain the OEM satellite radio antenna with the aftermarket SiriusXM tuner. Additionally, Alpine’s third brake light Jeep Wrangler reverse camera is also a very popular option. The Alpine HCE-TCAM1-WRA third brake light reverse camera is compatible with 2007-Up Jeep Wranglers and it works well with the big beautiful 9-inch i209-WRA screen. It features an optimal viewing angle along with water resistant and dustproof housing. The built in brake and reverse lights allow Jeep Wrangler owners to remove their factory third brake light for increased visibility. Alpine also includes 3 different mounting accessories to insure a perfect fit whether you have factory wheels or aftermarket wheels. Alpine i209-WRA and Alpine third brake light camera view – installed at Sounds Incredible Mobile, Brookfield, CT.
Aside from satellite radio and the brake light Jeep Wrangler reverse camera, you may also want to consider Alpine’s KAC-001 external accessory control module. This electronic switching interface allows users to control external accessories such as a winch, lighting, suspension etc. directly from the head unit. Additionally, I will mention the included iDatalink Maestro allows users to check out battery voltage, read and reset check engine codes, see tire pressure monitoring and vehicle performance gauges on screen. The only common features missing here are a CD/DVD player and on board GPS Navigation. However, if you’re using Apple CarPlay or Android Auto, that probably won’t be anything you’ll really need. If you prefer on board GPS for traveling through dead zones and like having a built in CD/DVD player, consider the x209-WRA. This model contains those additional features, albeit at a substantially higher cost. 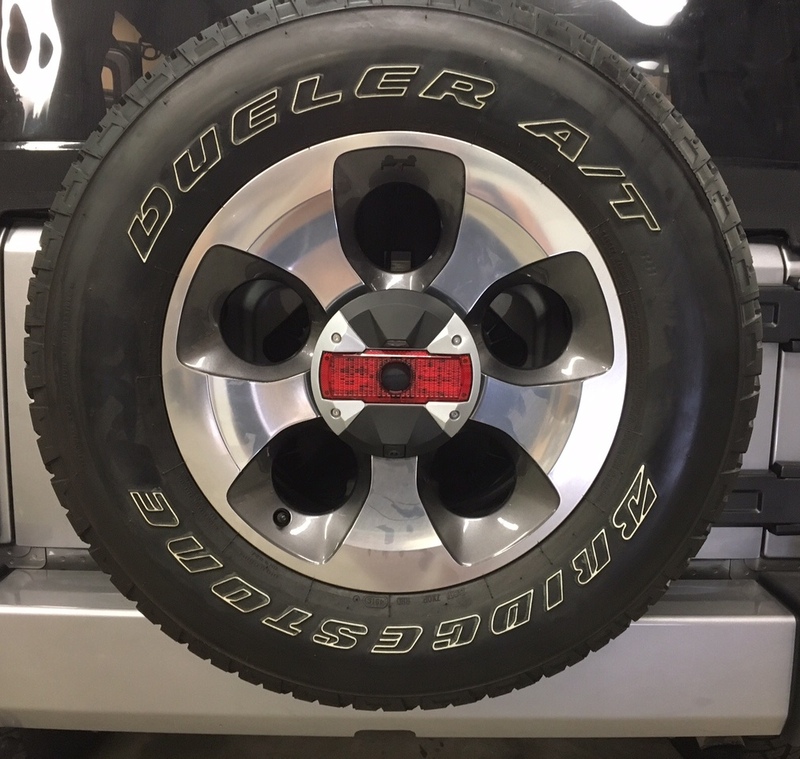 If you’re in Litchfield or Fairfield county of Connecticut or of Dutchess or Putnam County, New York and you’re interested in having the i209-WRA installed in your Jeep Wrangler, contact us today to learn more. Have you installed the i209-WRA or X209-WRA in your Jeep? If so, comment below and let me know what you think of it! Hi Annie, great blog and thank you to the people who commented on the i209-wra, it helped me decide to move ahead with the purchase and install, and I’m glad I did. I have a ’17 unlimited Sport S and I also installed the i209-wra with the hce-tcam1 -wra along with an Alpine PWE-S8, MRV-F300 and the new Alpine R-S65C R-series 6.5’s in the front and soundbar. Install include the SiriusXM-SXV300V1 tuner as well. The sub and amp are both installed under the passenger seat and I am extremely impressed with the sound quality. I’ve started reading up on tuning the receiver which has a 9 band parametric EQ, with timing and crossover capabilities. I might just pay an audio shop to do it and get it done right. Would take any feedback here. I do have a question about getting the back up grid lines to appear on the display, which I can’t seem to do. Would love to know how the CT folks did it. Like others said, the install is plug, and plug and plug and plug and play…lots of connections but Alpine made it real easy to figure them all out. So I’m glad I did the install myself, took some time but saved some money. Thanks again to all who’ve commented and great blog Annie.! Thank you for the feedback! I’m glad you’re enjoying the new stereo. For the camera adjustment, check out page 45 of the owner’s guide. Go to System Setup, select Camera, then select Guide Adjustment. In this menu you can turn the guide on/off and adjust it. I don’t think you’ll be able to access that screen unless you install a parking brake connection and it also says you won’t be able to access it if you have “Camera Select” set to “Off” or “Other”. That feature will only work if “Camera Select” is set to “Front” or “Rear”. As far as the professional tuning – be careful. I had a customer with one of these installed by another well known authorized Alpine dealer and they had set up the time correction completely incorrectly which was making it sound terrible. We got it corrected for him, but the point is, sadly, there are “professional” shops out there that can manage to make a good stereo sound worse. So do some research, if there is an installer or dealer in your area known for their sound quality systems, it’s probably worth having done. A proper tuning can make a big difference in sound quality. The KAC-001 Module is definitely worth installing too while the dash is already apart to get the most out of the i209 and x209 head units. It allows you to operate all your external accessories (Winch, Auxillary Lights, Onboard Compressor etc…), right through your touch screen. And at under $200, it’s actually less expensive than what it would cost to add most of the manual toggle switch banks that you would need to do the same thing. The only add-on that I don’t really see a useful purpose for is the KCX-C250MC multi-camera module. 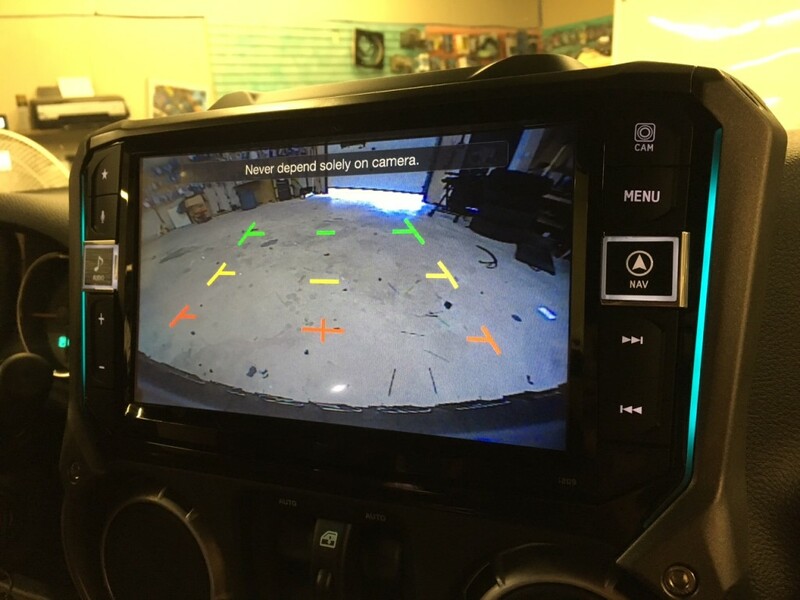 A backup camera makes sense on a vehicle like the jeep that has limited rearward views over the tire and between the rear headrests. But the additional 2 side camera’s that you “could” install with the KCX-C250MC are only “manually” selectable. As far as I know there isn’t a way to have these camera’s automatically come on when someone cruises into your rear blind spots like many of the newer collision avoidance options can on newer vehicles. I think the additional camera inputs with that expansion module might be helpful for serious off roaders if they were placed in a way to monitor a rock crawling situation – rather than a blind spot style camera. By the way, if you did want a blind spot camera set up, GCH automotive has an aftermarket blindspot camera kit designed to work with aftermarket radios with a standard video input. It uses the head unit’s universal camera input and splits it into 3 inputs for left and right blind spot cameras, plus the reverse camera input. The module gets wired to the turn signals and triggers the blind spot cameras upon signaling and reverse camera still gets triggered by reverse trigger. Pretty neat product. Hey Annie I really like your blog and I also own a Jeep Wrangler so it was nice to read the Wrangler stereo system guide you posted a while back. I did purchase the i209-wra unit and plan to install it along with the hce-tcam1-wra and the kac-001 unit this coming weekend. I had a problem when i tried to figure out the video in motion bypass but it turns out Alpine eliminated the foot brake wire. I also noticed a small upgrade from the x109-wra unit is that the side mounting brackets for the headunit/nose piece are now adjustable because some people we’re complaining that the nose piece did not sit flush with the dash trim. So it’s nice to see they listened to the customers out there. I’m also throwing in my Compustar Pro T11 alarm/remote start and adding some other bells and whistles like battery backup, proximity sensor, glass break and window roll up/down modules. So I will definitely have my work cut out for me. I’ll check back in and let you know how it goes and hopefully it will be a positive review for Alpine! That’s awesome, thank you for the feedback. Yeah for the bypass, have you tried the TR1? That’s a pretty handy little part. And I’m also glad to hear Alpine is listening to their customers, sometimes it takes them awhile to come around, but it’s awesome when they do. The Compustar Pro T11 is an awesome remote. I love the Compustar stuff for Jeep’s. It’s so easy to set for manual transmission and whether you’re using a BLADE-AL and FT-7200, FT-7300 or one of their new all in one’s like the DC-3 (mainly for remote starter in automatics), the install is very clean and easy to program. Yes, let us know what you think of the i209-WRA after you’ve had a chance to get to know it. Thanks Joe! Ok so it took a bit of trial and error to get the Compustar CM-7000 to work properly with the DEI 535t window roll up module. The usual standard Orange Rearm wire works a bit different with a Compustar so I decided to use their Ground While Armed wire to do the window roll up task. With that little hiccup aside I really like the Pro T11 remote and also the reservation mode for manual trans is so easy to use. Just park the vehicle, step on the brake then release it and pull up the e-brake. I feel it’s what I normally do when I park my Jeep anyway so it’s perfect. I haven’t really had much of a chance to test the remote’s range. I’m figuring close to a mile here in radio wave saturated NYC. The i209-wra is outstanding. Well worth the money I paid for it. The harness was completely plug and play except for the reverse wire connection in the passenger side kick panel (for manual transmission only). Programming the maestro was very simple and also I reprogrammed some of my steering wheel controls. I tested the HDMI input via an Apple Lightning to HDMI converter and it works awesome! For the video in motion bypass I used a BestBypass brand unit and it worked flawlessly for this task. The HCE-TCAM1-WRA backup cam installed easily and it works very well even in low light conditions thanks to its “extra” reverse light. I’ve owned other brand headnuits before and I just feel Alpine always knocks it out of the park. Their prices are usually a bit steeper but this radio is made in Japan and that’s quality you can’t get anymore in this segment. The dash/trim piece lines up perfectly and it just blends in like it came from Jeep that way (I wish it did). Overall 10/10 for Alpine, Compustar, DEI (window modules, glass break), and Omega (proximity sensor). Thank you for the feedback Joey! How is the Omega proximity sensor? I’ve never had great luck with the DEI 508D – I find it’s either too sensitive or not sensitive enough and for some reason it tends to false when it rains. The omega proximity sensor works really well. You have to adjust the pre-warn/warn away zone first to the desired range. I would adjust it so that if someone physically touches thw vehicle it will go off. I also live in NYC so I don’t want her to false everytime I’m parked in a parking lot etc. The full trigger screw I would adjust so that if someone reached in it will trigger. I’m going to move my proximity sensor from the transmisson tunnel area to the center console. So far everything works as designed just the Carplay interface bugs out every now and again but it’s Apple’s fault so just have to deal for now haha.